Sabrina L. ’20 has been honored by the National Council for Women in Technology (NCWIT) with a 2019 Aspirations in Computing Award! She joins 12 other honorees from the Hudson Valley Region, and gains access to an established network of talented students and alumni, scholarships, internships, and jobs, and more. Computer Science Instructor Chiara Shah encouraged Sabrina to apply for the award after her noting her impressive drive and passion for computing. Before arriving on campus as a new teacher this year, Sabrina reached out to Chiara about qualifications to get into her AP Computer Science A course. 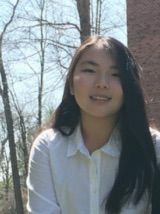 Sabrina’s older brother had introduced her to coding websites, and from there she was inspired to teach herself more advanced topics and enroll in a summer course at Rennselear Polytechnic Institute (RPI). Chiara was impressed by her work ethic and the quality of her programming projects from the course. “Sabrina said the course was challenging and that they went through projects quickly, but her projects were on par with projects I have my AP CS A students complete at the end of the year, after the AP exam,” she said. This incredible work ethic is evident in the classroom, where Chiara says Sabrina often comes to her with questions about lessons that are planned for months later. “I have rarely taught a student with this much motivation and desire to work independently,” she says. This year, in addition to her course work, Sabrina, a programmer for Emma’s new robotics team, has taught herself the VEX Coding Studio environment. Chiara explains that VEX introduced a new programming language this year and that Sabrina has established herself as a key resource for her teammates. “Sabrina is an exemplary, dedicated student with so much potential,” says Chiara. Please join Emma Willard School is commending Sabrina on this impressive honor!